This installment of our Super-Powered series for the Savage World rules provides rules for designing Organizations following a format very similar to creating characters. Using these rules, organization are quick to build and easy to use in your games in a way that makes sense. Within this Super-Powered: Organizations PDF you will find a step-by-step process for building organizations. Each organization has attributes, skills, Hindrances, and Edges, just like characters. However, details like the amount of people in the organization are purposefully kept abstract so you can scale encounters to your group of heroes, no matter how big or small. Organizations designed with these new rules provide enough substance to get a solid idea of what the group does, what it is capable of, and what its strengths and weaknesses are. However, they remain sufficiently detail-lite to remain adaptable and not slow down gameplay. This product includes organization game stats for three previously published organizations, found in other Misfit Studios products: A.E.G.I.S., International CrimePrev Technologies, and Operation: Marshal Law. 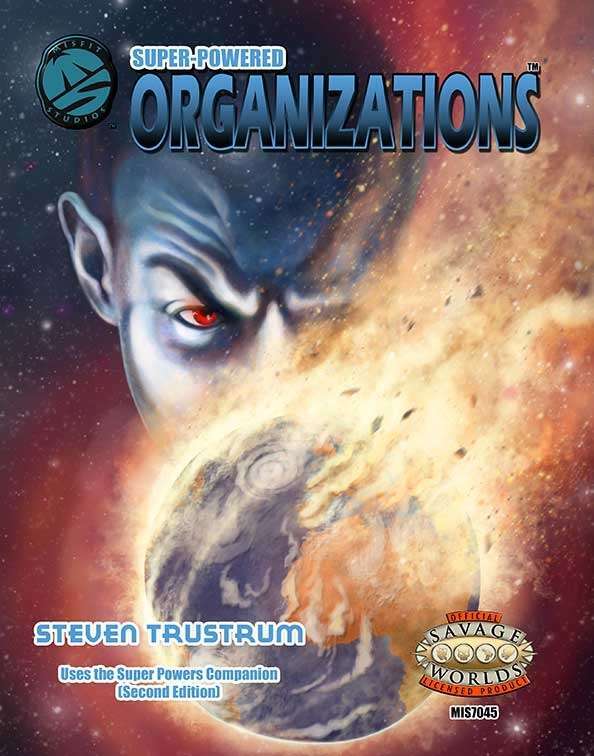 Although intended for use in super hero genre games using the Super Powers Companion (Second Edition), Super-Powered: Organizations enables you to build organizations for any genre. Create a brotherhood of space pirates for your science fiction game, for example, or a secret order of assassins for your fantasy game.